Always make sure that you're topped up with spare compost. Rich in micro-organisms and eco-friendly multi-purpose compost. Supplied loose ready to fill your new timber bay. 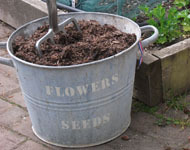 Organic Peat Free Compost and Clean Topsoil can be supplied and delivered with your order. It’s so important to feed the soil. In an area that is to be planted in for the first time in ages you must add new rich nutrient based Compost. I always believe that if you feed the soil each season then your crops (especially rooted crops) will thrive. - Just imagine your little seedling nuzzling into the warm rich compost, bursting with life. This practice is an old and proven Organic method that is thankfully coming back into vogue. So that’s why I recommend a mix of Organic Peat Free Compost and new Topsoil. Why Organic Peat Free Compost? Organic Peat Free Compost is a light and airy compost, with good retention of moisture (because it is Peat Free). It is excellent muti purpose compost, whilst retaining the heat it will also help improve your yield as it contains many micro organisms. This Compost is eco friendly too, made from recycled garden cuttings and tree surgeons cuttings, which would have previously gone to land fill sites. So by using it we all do our bit for the environment. Please see quantities and prices on the Order Page. 1. 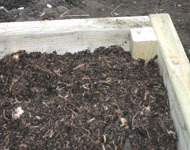 Tip the Organic Peat Free Compost into your new raised bed. You really want the compost level to finish about 2” below the raised bed height. This will save the compost spilling out as you “work it in”. 2. Dig in well so that the compost is thoroughly mixed with the existing soil, make sure the finished height is level. This is the richest part of the earth's ground containing natural minerals, bacteria and natural decomposing earth materials. It is essential to work in top soil to keep a good ph balance.